Slovakia is largely focused on industrial exports (especially automotive related). Slovakia’s economy grew 3.3% in 2016 and is expected to stay strong at 3.1% in 2017, but the country remains vulnerable to downturns in the eurozone and Germany in particular. Slovakian suppliers are some of the least likely of the suppliers surveyed in the Eastern European region to offer credit terms to B2B customers. Despite this, in 2017 there was an increase in sales on credit terms. On average, 29.7% of the sales to domestic B2B customers was transacted on credit. This is slightly lower than the 31.3% of sales made on credit to foreign B2B customers and may highlight a uniform perception of risk arising from transactions with both domestic and foreign B2B customers of Slovakian respondents. The total value of B2B sales on credit increased to 30.5% in 2017 from 26.5% in 2016. This follows a more significant increase (up from 19.5% in 2015) and seems to underline an upward trend. The percentages of both domestic and foreign B2B sales on credit in Slovakia are much lower than the averages for Eastern Europe overall (domestic: 42.7%; foreign: 37.9%). The percentage of overdue B2B invoices in Slovakia decreased from 48.0% in 2016 to 41.5% this year. The 2017 payment default rate recorded in the country is in line with the average for Eastern Europe overall (41.5%). Respondents in Slovakia (domestic: 89.3%; foreign: 72.3%) seem to have experienced late payments of foreign B2B invoices less often than their peers in Eastern Europe (domestic: 88.5%; foreign: 78.9%). Similarly to what was observed at the regional level, overdue B2B invoices occurred more often with the domestic customers of our Slovakian respondents (46.5%) than with their foreign customers (36.4%). These averages are almost in line with those registered in Eastern Europe overall (domestic: 45.2%; foreign: 37.7%). The Days Sales Outstanding (DSO) figure in Slovakia decreased slightly from 39 days in 2016 to 38 days this year. While the DSO change in Slovakia is minor, the difference between the country’s DSO and the regional average DSO (61 days) is more than three weeks. Among the Eastern European countries surveyed, Slovakia had the most respondents (82.3%) who stated that they do not foresee changes in their annual DSO figure over the coming 12 months. 14.6% of Slovakian respondents expect a slight increase and 2.4% a slight decrease. The payment duration in Slovakia decreased from 56 days in 2016 to 51 days this year. This means that respondents in the country have to wait fewer days to turn B2B receivables into cash. In 2017, domestic B2B customers were given, on average, 33 days from the invoice date to settle their invoices. This is one day longer than the average domestic payment term in 2016. Suppliers in Slovakia asked their foreign B2B customers to settle their invoices on average within 38 days. This is also two days longer than last year. The longer average payment terms in 2017, allowed B2B customers of Slovakian suppliers, on average, one day more than B2B customers in other Eastern European countries surveyed to fulfil their payment obligations. Respondents in Slovakia reported a decrease in the average payment delays of their domestic and foreign B2B customers. Domestic B2B customers of respondents in Slovakia delayed payments, on average, by 18 days (2016: 26 days). The decrease for foreign B2B customers was not as significant; foreign B2B customers delayed payments 12 days on average (2016: 18 days). In 2017, suppliers in Slovakia needed to wait 25 days (three days less than in 2016) to convert B2B receivables into cash. This compares to 29 days in Eastern Europe overall. Similarly to what was observed at regional level, payment of invoices in Slovakia seems to have been delayed most often because of insufficient availability of funds and buyers using outstanding invoices as a form of financing. Compared to 2016 when 72.8% of respondents in Slovakia reported that late payments occurred most often because of liquidity constraints, the percentage of respondents citing this delay factor decreased to 60.6% in 2017. A similar observation can be made in respect to payment delays because of liquidity constraints by foreign B2B customers (2017: 50.0% down from 54.7% in 2016). Another main reason for payment delays was the buyers’ use of outstanding invoices as a form of financing (domestic: 32.3%; foreign: 32.0%). More Slovakian respondents stated this reason for payment delays this year than in 2016 (domestic: 29.6%; foreign: 26.3%). Most respondents in Slovakia (58.7%) stated that overdue payments did not impact their businesses significantly. 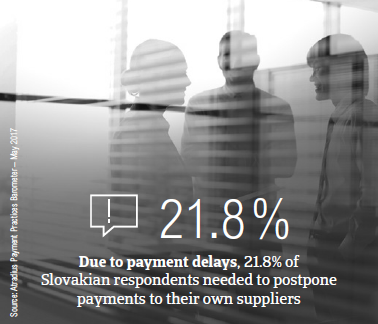 21.8% of Slovakian respondents, however, said that due to late payments, they needed to postpone payments to their own suppliers. Among the Eastern European countries surveyed, Slovakia is the country least inclined to expand their current mix of credit management tools and increase protection against risks stemming from Brexit, the slowdown in Asia and US protectionism. More respondents in Slovakia (59.9%) than in Eastern Europe (53.3%) stated their preference to maintain their current mix of credit management tools. A low 2.8% of respondents in Slovakia said that they are likely to do more to protect themselves from risks arising from the above-mentioned developments. This percentage is significantly lower than in Eastern Europe overall (13.1%) and is the lowest in the region. When asked about which credit management actions they would take, Slovakian respondents stated that they are most likely to check their buyers’ creditworthiness more frequently (5.5%) and least likely to increase their use of collection agencies (0.8%). To manage potential risks stemming from Brexit and US protectionism, respondents in Slovakia stated their intention to increase creditworthiness checks of their buyers (Brexit: 6.2%; US protectionism: 6.4%) and monitoring of their buyers’ credit risk (Brexit: 3.2%; US protectionism: 3.3%). The slowdown in Asia seems to be the least likely to prompt Slovakian respondents to increase protection and use of credit management tools. The total value of B2B receivables written off as uncollectable in Slovakia decreased from 0.5% in 2016 to 0.3% this year. 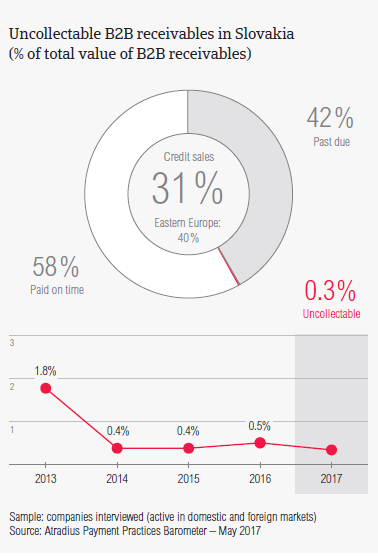 Among the Eastern European countries surveyed, Slovakia had the lowest percentage of uncollectable receivables. Similarly to what was observed in previous surveys, there were slightly more domestic write-offs registered in Slovakia (domestic: 0.2%; foreign: 0.1%). The percentages of the total value of B2B receivables in Eastern Europe were higher (domestic: 0.8%; foreign: 0.2%). In 2017, the largest proportion of uncollectable receivables came from the construction, machines and services sectors. B2B receivables were uncollectable mainly because the customer went bankrupt (68.4%), the customer could not be located (19.3%) and because of the high cost of pursuing debtors (19.3%). 80.0% of respondents surveyed in Slovakia do not expect changes in the payment behaviour of their B2B customers over the coming 12 months. This compares to 58.0% in Eastern Europe overall. B2B customers of Slovakian respondents in the chemicals (49 days), paper (45 days), transport (44 days) and metals (40 days) industries enjoyed payment terms longer than the country average (36 days). In contrast, B2B customers originating from the services sector (24 days) were given shorter average terms to fulfil their payment obligations. B2B customers in the machines industry generated an above average (for the country) proportion of past due invoices. According to 67.0% of respondents, slow payment from B2B customers from the machines industry is most often due to buyers’ use of outstanding invoices as a form of financing. 33.0% of respondents stated insufficient availability of funds as a key payment delay factor. Around 25% of Slovakian respondents expect an improvement in the payment behaviour of their B2B customers over the coming 12 months and 6.0% said that they anticipate an overall deterioration.